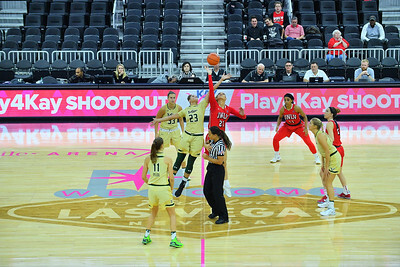 December 21, 2016; Las Vegas, Nev.; The South Florida Bulls and UNLV Lady Rebels jump for the tip during the 5th/6th place game of the inaugural Play4Kay Shootout at the T-Mobile Arena. 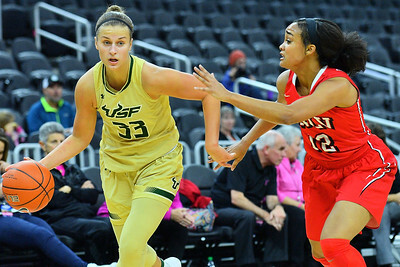 South Florida defeated UNLV 77-42. 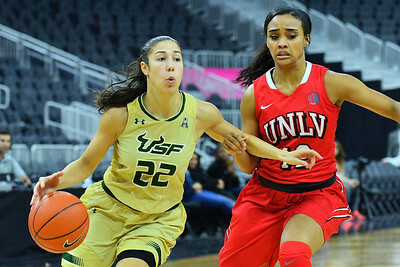 December 21, 2016; Las Vegas, Nev.; South Florida Bulls guard Laia Flores (22) drives past UNLV Lady Rebels guard Dakota Gonzalez (12) during the 5th/6th place game of the inaugural Play4Kay Shootout at the T-Mobile Arena. 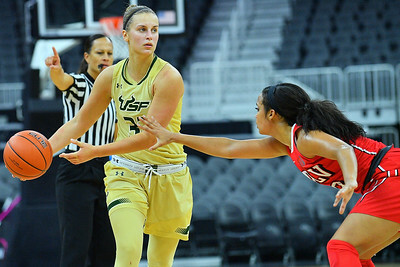 South Florida defeated UNLV 77-42. 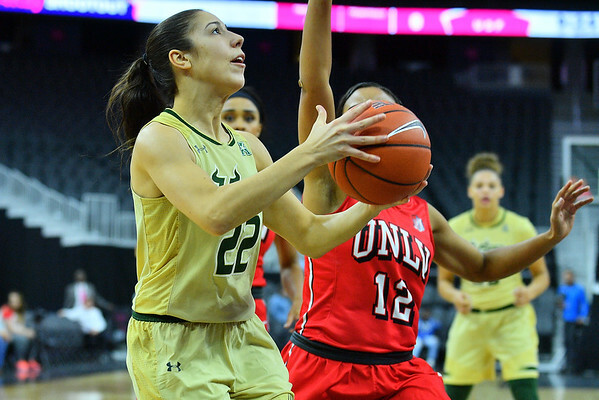 December 21, 2016; Las Vegas, Nev.; South Florida Bulls guard Laia Flores (22) goes up for a shot during the 5th/6th place game of the inaugural Play4Kay Shootout at the T-Mobile Arena. 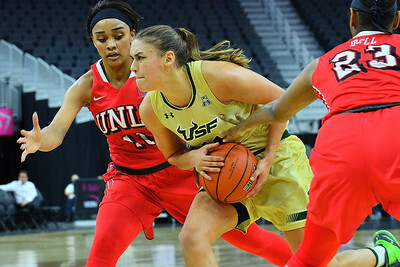 South Florida defeated UNLV 77-42. 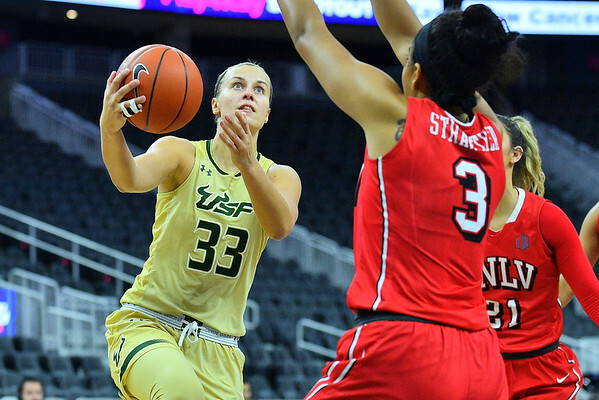 December 21, 2016; Las Vegas, Nev.; South Florida Bulls forward Kitija Laksa (33) drives to the basket during the 5th/6th place game of the inaugural Play4Kay Shootout at the T-Mobile Arena. South Florida defeated UNLV 77-42. 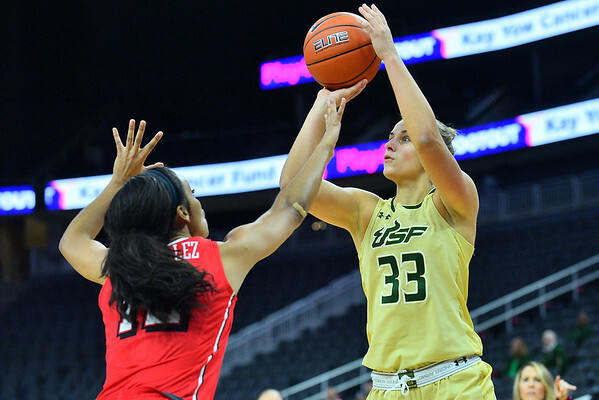 December 21, 2016; Las Vegas, Nev.; South Florida Bulls forward Kitija Laksa (33) shoots over UNLV Lady Rebels guard Dakota Gonzalez (12) during the 5th/6th place game of the inaugural Play4Kay Shootout at the T-Mobile Arena. South Florida defeated UNLV 77-42. 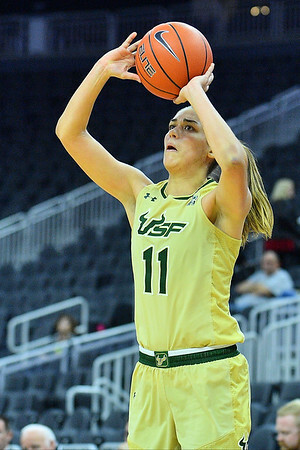 December 21, 2016; Las Vegas, Nev.; South Florida Bulls guard/forward Ariadna Pujol (11) shoots a jump shot during the 5th/6th place game of the inaugural Play4Kay Shootout at the T-Mobile Arena. South Florida defeated UNLV 77-42. 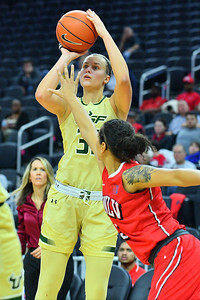 December 21, 2016; Las Vegas, Nev.; South Florida Bulls forward Maria Jespersen (12) lines up a shot during the 5th/6th place game of the inaugural Play4Kay Shootout at the T-Mobile Arena. South Florida defeated UNLV 77-42. 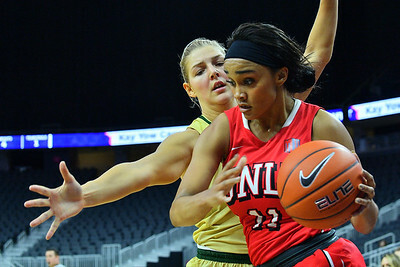 December 21, 2016; Las Vegas, Nev.; South Florida Bulls forward Kitija Laksa (33) drives past UNLV Lady Rebels guard Dakota Gonzalez (12) during the 5th/6th place game of the inaugural Play4Kay Shootout at the T-Mobile Arena. South Florida defeated UNLV 77-42. 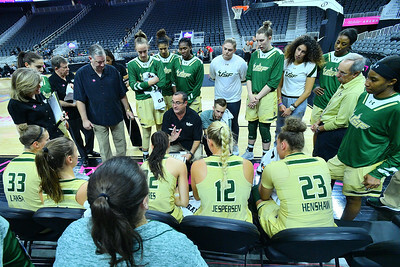 December 21, 2016; Las Vegas, Nev.; South Florida Bulls head coach Jose Fernandez talks to his team during a timeout during the 5th/6th place game of the inaugural Play4Kay Shootout at the T-Mobile Arena. South Florida defeated UNLV 77-42. December 21, 2016; Las Vegas, Nev.; South Florida Bulls guard/forward Ariadna Pujol (11) drives past UNLV Lady Rebels guard Brooke Johnson (2) during the 5th/6th place game of the inaugural Play4Kay Shootout at the T-Mobile Arena. South Florida defeated UNLV 77-42. 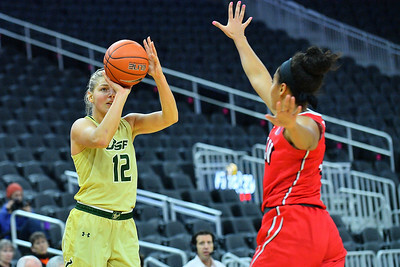 December 21, 2016; Las Vegas, Nev.; South Florida Bulls forward Maria Jespersen (12) shoots over UNLV Lady Rebels guard Dakota Gonzalez (12) during the 5th/6th place game of the inaugural Play4Kay Shootout at the T-Mobile Arena. South Florida defeated UNLV 77-42. 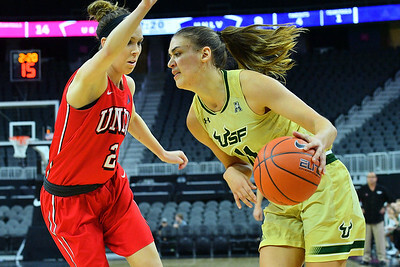 December 21, 2016; Las Vegas, Nev.; South Florida Bulls forward Maria Jespersen (12) guards UNLV Lady Rebels guard Dylan Gonzalez (11) during the 5th/6th place game of the inaugural Play4Kay Shootout at the T-Mobile Arena. South Florida defeated UNLV 77-42. 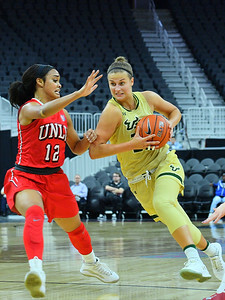 December 21, 2016; Las Vegas, Nev.; South Florida Bulls guard/forward Ariadna Pujol (11) drives hard into the lane against UNLV Lady Rebels guard Dylan Gonzalez (11) during the 5th/6th place game of the inaugural Play4Kay Shootout at the T-Mobile Arena. South Florida defeated UNLV 77-42. 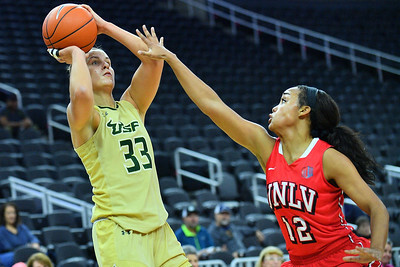 December 21, 2016; Las Vegas, Nev.; South Florida Bulls forward Kitija Laksa (33) looks to drive past UNLV Lady Rebels guard Dakota Gonzalez (12) during the 5th/6th place game of the inaugural Play4Kay Shootout at the T-Mobile Arena. South Florida defeated UNLV 77-42. 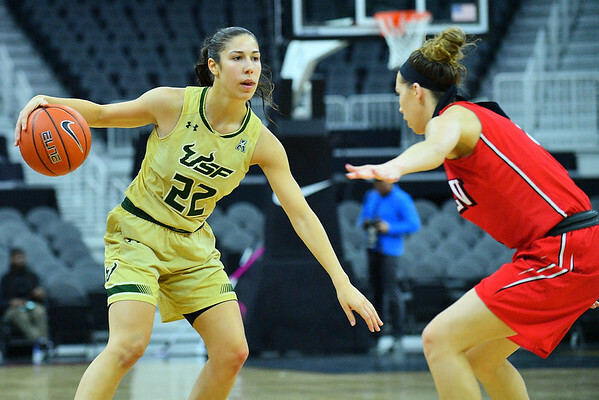 December 21, 2016; Las Vegas, Nev.; South Florida Bulls guard Laia Flores (22) looks to drive past her defender during the 5th/6th place game of the inaugural Play4Kay Shootout at the T-Mobile Arena. South Florida defeated UNLV 77-42. 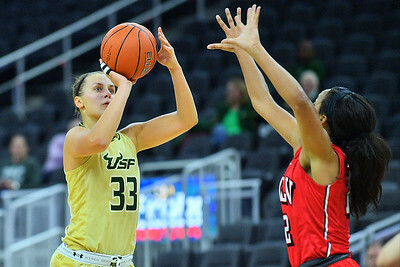 December 21, 2016; Las Vegas, Nev.; South Florida Bulls forward Kitija Laksa (33) shoots a jumper during the 5th/6th place game of the inaugural Play4Kay Shootout at the T-Mobile Arena. South Florida defeated UNLV 77-42. December 21, 2016; Las Vegas, Nev.; South Florida Bulls guard Laia Flores (22) gets a layup during the 5th/6th place game of the inaugural Play4Kay Shootout at the T-Mobile Arena. South Florida defeated UNLV 77-42. 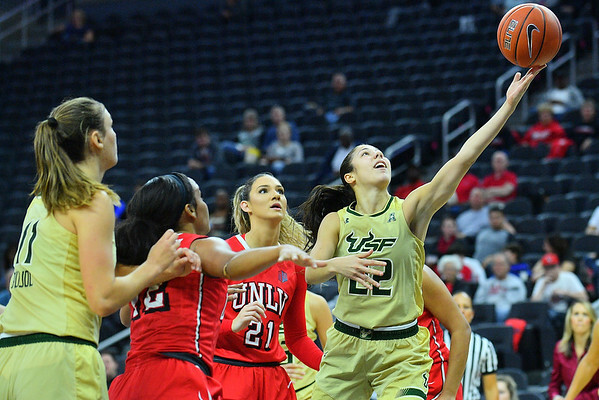 December 21, 2016; Las Vegas, Nev.; South Florida Bulls forward Kitija Laksa (33) shoots a jumper over UNLV Lady Rebels guard Dakota Gonzalez (12) during the 5th/6th place game of the inaugural Play4Kay Shootout at the T-Mobile Arena. South Florida defeated UNLV 77-42.